Often described as "feisty," the Rufous may have the ideal size-to-weight ratio among North American hummingbirds. This bird outflies all other species, and usually gets its way at feeders at the expense of slower, less-maneuverable hummers. 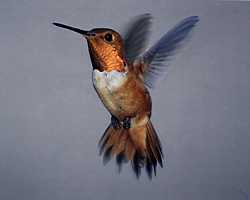 The Rufous has the longest migration route of all US hummingbirds. Average weight: male 3.22 g, female 3.41 g. Females are larger than males. Observed in every state and province except Hawaii, Prince Edward Island, and Quebec. There was even one very unusual report from extreme eastern Siberia! 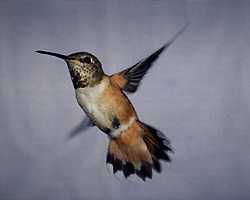 The Rufous is the most widely-distributed hummingbird in North America. Winters in Mexico and possibly Panama.